On Aug. 5 or Aug. 6, depending on which part of the country you’re in, the Curiosity spacecraft careening toward Mars will hit the Red Planet’s atmosphere, deploy a supersonic parachute and either land safely on the planet’s surface or perish. It’s dramatic stuff, and NASA has produced this Hollywood-style YouTube video, complete with animation and suspenseful music, to preview the landing, evoke that drama and put viewers on the edge of their seats. As engineers explain, it will take seven minutes for Curiosity to travel from the edge of Mars’ atmosphere to the surface, going from a speed of 13,000 mph to zero. “If any one thing doesn’t work just right, it’s game over,” engineer Tom Rivellini says. Because Mars is so far away, it actually takes 14 minutes for the spacecraft’s signal to reach Earth. So by the time we learn the spacecraft has hit the top of Mars’ atmosphere, Curiosity will have either have survived the landing or perished for a full seven minutes. Listen to the soundtrack for The Dark Knight Rises – free online! As part of our countdown to the release of The Dark Knight Rises, we have a very special treat for you today. Below you can listen to the film’s Hans Zimmer soundtrack in its entirety, giving you a taste of the atmosphere and action you’re in for come July 20.
Zimmer has, of course, worked on all three of Christopher Nolan’s Bat-films, having shared composition duties on Batman Begins and The Dark Knight with James Newton Howard. This time, however, he’s flying solo. This soundtrack is released by Sony Classical on July 16, and will be available from Amazon and iTunes for your listening-in-posterity pleasure. The Dark Knight Rises hits cinemas on July 20. Source: Empire – The Dark Knight Rises Soundtrack! Continue reading Listen to the soundtrack for The Dark Knight Rises – free online! Posted on July 15, 2012 Author robotchampionCategories defaultTags amazon, atmosphere, bat, batman, christopher nolan, composed, empire, film, free, hans zimmer, itunes, james newton howard, july 20, listen, listening, motion picture, music, online, original, soundtrack, the dark knight risesLeave a comment on Listen to the soundtrack for The Dark Knight Rises – free online! For several years scientists have been begging to test their theories about Mercury, the closest planet to the Sun. You see, the radar signals come back showing ice exists on the planet, but how could ice exist on a planet so incredibly hot? NASA sent the spacecraft MESSENGER to orbit the planet and figure the mystery out (among other things). It turns out that ice exists at the planet north and south poles and possibly underneath some “dirt-shielding”. This thin, dark layer is called a regolith and is probably made of organic substances like the Earth’s soil, rich in hydrocarbon compounds that may have come from the comets and meteorites that struck the planet over time. The comets and meteorites may have also contributed the water that seeped under the soil cover to form the icy patches. MESSENGER (Mercury Surface, Space Environment, Geochemistry and Ranging) is the first spacecraft to orbit Mercury. Its goal is to collect better data about the composition and atmosphere of the planet, and it just completed its first year of information gathering. While the mix of water and organic compounds on another planet may raise the possibility of extraterrestrial life for some scientists, this is not what excites Paige. For him, the discovery of ice on Mercury is the triumph of science. Tomorrow morning NASA will launch a Mars Probe, MSL Curiosity, into space for an eight month space journey and then a one year trek across the surface of the planet. A new robotic mission to Mars, carrying 10 highly sophisticated instruments to seek the basic chemicals of life in the planet’s ancient rocks, is standing on the launchpad at Cape Canaveral, ready to lift off Saturday morning aboard an Atlas V rocket on a 350 million-mile journey. The six-wheeled rover named Curiosity is headed for the flanks of a Martian mountain that exists inside a crater where layers of sedimentary rock may hold evidence of what the planet was like a billion or more years ago: warmer, probably; wetter, most probably; and an abode for living organisms – just maybe. 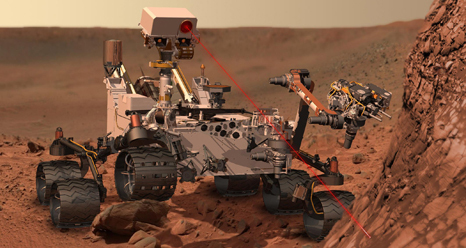 Curiosity’s tools will drill into the mountain’s layered rocks and zap them with a laser so spectrometers can analyze the powdery particles to determine their composition. There’s more to the story than lasers and spectral analysis, including a return to nuclear powered robots, this one has a core of plutonium. Not to mention that Curiosity looks like Johnny Five’s bigger, geekier older brother, but that’s not what fascinates me. It’s the science fiction that does. Two key elements of this mission remind me directly of Star Wars. The first is the Sky Crane that uses rocket thrusters to lower the robot to the surface of Mars.